Note: If you can’t find okra–or just don’t like it–you could substitute an equal quantity of trimmed green beans. If you do, though, you’ll need to find some other way to thicken the curry. The easiest way to do this is to dissolve 2 tsp cornstarch in an equal amount of cold water, then stir it into the finished curry before adding the eggs. Place the eggs in a small saucepan with cold water to cover. Bring the water to a boil, cover the pot, turn off the heat and let sit for 6 minutes. Drain the eggs and rinse them in very cold water. Peel the eggs, then set them aside. In a large deep-sided skillet, heat the oil over medium-high heat until it shimmers and thins. Gently use your fingers to separate the shallot slices into rings, then drop the rings into the hot oil. Fry, stirring frequently, for 5-8 minutes, or until the shallots are deeply browned and crispy. Remove from the skillet with a slotted spoon and place on paper towels to drain. Set aside. Add the cooked, peeled eggs to the pan, and reduce the heat to medium. Fry the eggs for 3-4 minutes, turning them every minute or so to get them browned on as many sides as possible. Remove from the skillet and place on paper towels to drain. Set aside. Add onion, turmeric and chili(es), and stir-fry for about 3 minutes, or until the onions are beginning to soften. Add garlic and ginger, and continue cooking for another 1-2 minutes, or until the onions are translucent and everything is fragrant. Add tomato paste, stirring to coat the aromatics in it, and cook for another 2 minutes. Stir in curry powder and cook 1 additional minute. Add okra, tomatoes and a big pinch of salt, and cook for an additional 2 minutes. Add water and fish sauce or soy sauce, and bring the liquid to a rolling boil. Reduce heat to medium-low and simmer, uncovered, for 8-10 minutes, or until the okra is just tender and the sauce has reduced and thickened. Taste and adjust the salt level, if needed. 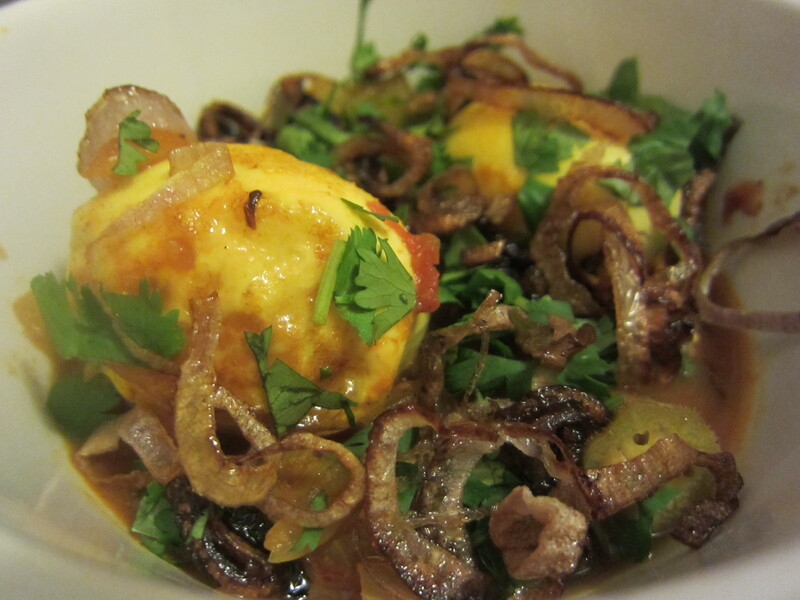 Add the eggs back into the curry, nestling them into the sauce. Simmer 1 minute more, just to warm the eggs through. Turn off the heat and let the curry rest for 3-5 minutes. Sprinkle the crispy shallots and chopped cilantro on top, and serve with rice or quinoa, if desired. This sounds great. I used to make a coconutty Sri Lankan curry with eggs but I like the sound of this one, especially with the fried shallots. I bet leaving town after this dish made you eager to get home to your own kitchen again! This sounds great, especially over a bowl of rice! Oh, definitely. The sauce is a little on the thin side, so having something to soak it up is great.